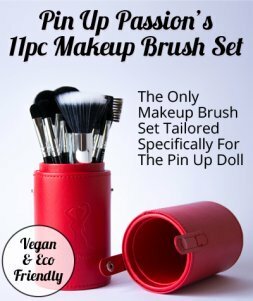 The only brush set tailored for the pin up glamor makeup look inclusive of 11 high quality brushes and a stylish travel holder. These brushes come with online tutorials on how to use each of the brushes, the brushes are Vegan & Eco Friendly, 60 day money back guarantee and free shipping with Amazon.com within the USA. 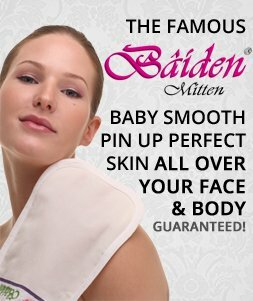 If you're yet to hear of the Baiden Mitten, you're in for a real treat.This mitten is made of all natural bamboo, specially woven to grip the top layer of dead skin and pull it off you, revealing soft, more youthful skin underneath.The mitten provides the equivalent of the beauty salon treatment - microdermabrasion which is usually a $70 procedure just for the face. The mitten however is MUCH more affordable, lasts about 18 months, can be used in the comfort of your own home on your face AND body. The famous product that is guaranteed to transform the skin all over your body. Dresses. Skirts. Pin Up iPhone Covers. Posters. Pin Up Tops.